FAYETTEVILLE, Ark. 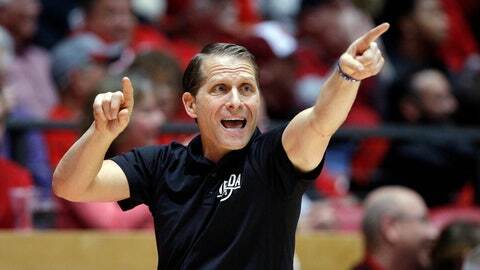 (AP) — Arkansas gave a rousing welcome to Eric Musselman, welcoming its new men’s basketball coach with a Monday pep rally at Bud Walton Arena. Razorbacks athletic director Hunter Yurachek spoke, the fans called the hogs and then Musselman and his family were introduced as T.I.’s “Bring ‘Em Out” blared over the sound system. Musselman said he was ecstatic to get the call from Yurachek. It helped that Musselman’s wife, Danyelle, has Arkansas ties (her father is from Magnolia). Musselman thanked Nevada’s administration and players and said he hopes he gets the same level of buy-in at Arkansas. The 54-year-old led Nevada to three NCAA Tournaments in four years after a nine-year absence. The Wolf Pack reached the Sweet 16 in 2018, but lost in the first round to Florida this year. Now, he’s committed himself to becoming familiar with Arkansas basketball. He met with the current players on Sunday night and has been in contact with former Arkansas players Corliss Williamson, Patrick Beverley, Tony Brown and Corey Beck. Musselman’s offense will emphasize shooting threes and getting to the free-throw line. There will be great freedom on offense and a very structured defense.